This one is all about the chicken meatballs, no frying and a nice change from the traditional beef and pork meatball. Preheat your oven to 350 and cover two cookie sheets with parchment paper. In a small bowl add a half a cup of milk to a cup of panko bread crumbs and let sit. Saute a couple of finely chopped shallots and three cloves of garlic then put in your Cuisiart with approximately two pounds of chunked boneless chicken thighs and one pound of breasts. Pulse until it is the consistency of hamburger then combine in a large bowl with a cup of grated parmesan, some chopped parsley or scallion tops, a lightly scrambled egg, ground pepper, a generous helping of kosher salt, and the soaked panko. Thoroughly stir the mixture then roll with your hands into one to one and a half inch balls and set them on the cookie sheets. Bake for fifteen to twenty minutes rotating the trays about half way through. 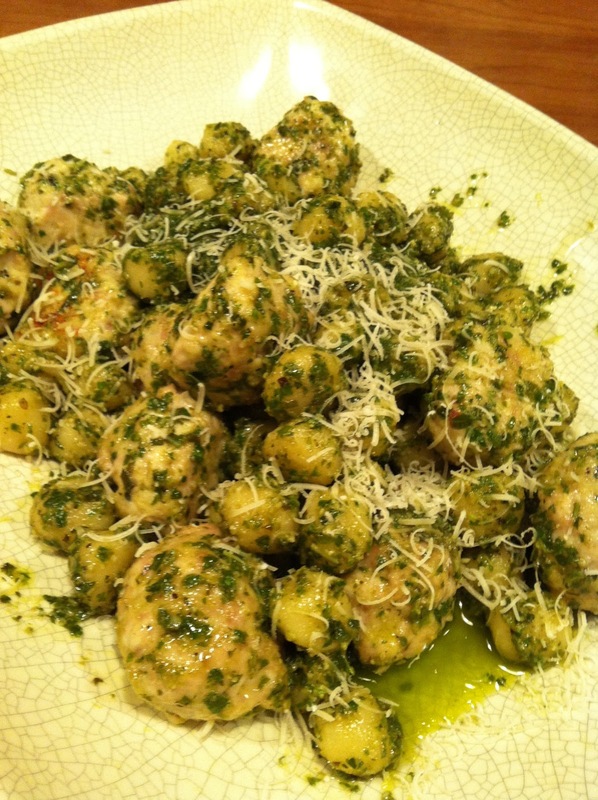 For this dish I combined my cooked meatballs with a basil pesto and some dried store bought gnocchi that I just had to boil for ten minutes. Other times I’ve added the meatballs to a pot of marinara and served them over ziti or spaghetti, melted mozzarella over them for a meatball sub, or added them to a chicken or potato soup. They’re even amazing cold right out of the fridge the next day.